The CLW chiller, available in 60- to 140-ton capacities, uses adaptive direct digital controls to modulate equipment based on conditions. 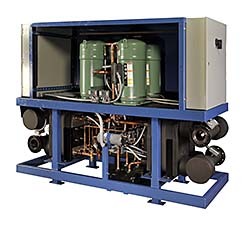 Features R-410A scroll compressor, 4- or 6-inch water connections, and balanced port bi-directional TXV or optional electronically controlled expansion valve. Available as either a water-cooled chiller or as a reversible option.